The Parana River is the third largest river in the American continent, after the Mississippi and the Amazon. Instead of flowing directly to the sea, it flows to the Rio de la Plata (located between Argentina and Uruguay) through a complex delta system. This delta is a large and heterogeneous territory that spreads over three provinces of Argentina and that is characterized by different dichotomies along its extension. On the one hand, the islands of the delta are young alluvial lands in constant transformation due to the processes of sedimentation, and are subjected to pulses of floods influenced by the Paraná River streamflow, droughts, precipitations and strong southeastern winds coming from the Atlantic Ocean. Although these alluvial territories seem to be pristine, they have been moderately altered as a result of the development of economic activities. On the other hand, along the edges of the delta, we find the older territories of the mainland, created in the Pleistocene and less dynamic. Here is a network of cities of dissimilar sizes, that establishes the wealthiest corridor of the country. Conurbations such as Rosario (located in the province of San ta Fe) and the Metropolitan Area of Buenos Aires (located in the homonym province), exert different pressures over the territory, generating an increasing impact on the delta system. In other words, this delta shows a contrast between the wild and dynamic condition of the islands and the more stable but strongly urbanized edges. Nevertheless, this dichotomy is not the only one that can be found in the delta. On the contrary, there are other oppositions regarding economic, policy and social realms, expressed through a polarized, unsustainable and unplanned land use, which turns the area into a vulnerable place, given the uncertain context of climate change. Although this delta can be considered an extreme and particular case, many of the conflicts that can be found in this area replicate in other deltas around the world. Urbanizing deltas are subjected to pressures related to urban growth and climate change, within a context of uncertainty and unpredictability. Those pressures interact at multiple scales and temporalities, affecting the components of the systems, as well as the relations between them and with the environment. This complexity reveals the need for the society (including governments, institutions, civil organizations, academia, etc.) to enhance the adaptability of the system of the delta, in order to cope with changes without losing their substantial characteristics. This research is focused on the study of the complexity of self-organizing processes that emerge in metropolitan areas located in (or near) delta territories, in order to link climate adaptation with urban development from an actor-oriented perspective. This aim is motivated by understanding urbanizing deltas as complex adaptive systems formed by physical components, social actors and their mutual relations, which are in constant adjustment within the system and with the environment, in an atmosphere of uncertainty. In such a complex context, small changes can trigger qualitative impacts, that force the system to adapt in order to return to a new dynamic equilibrium. For example, in urbanizing deltas, extreme climatic events can cause tragic consequences when the context is not capable of adapting to that circumstances, generating effects at all scales. This vulnerability makes necessary to prepare to possible disruptive events though innovative planning methods towards increasing the system´s adaptive capacity. For that purpose, and adopting a bottom-up criterion, this research bases on the understanding of the self-organizing processes that emerge in urbanizing deltas to design and implement a methodology that can be applied at the local level, to generate an impact at other scales. The method designed in this thesis also includes the development of scenarios in order to think about possible future events and reflect on the necessary policy and actions to make the system respond to changes in a more adaptive way. The scenarios, as well as all the indicators analysed along the process, are developed through participatory workshops, after an analysis of the actor-network of the area, and also of the local, provincial and national regulations. The method designed and implemented throughout this research is applied at the local level of the case study, and is flexible enough to be adapted for replicating it in other parts of the Argentinean Delta, in order to contribute to the increase of the systems´ adaptive capacity through the generation of initiatives at the local level that can generate an aggregate impact at higher levels. ZAGARE, Verónica. 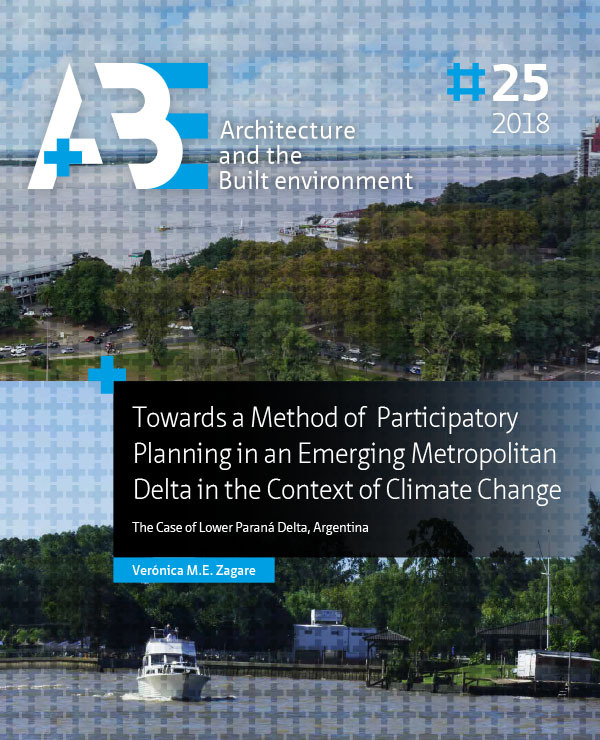 Towards a Method of Participatory Planning in an Emerging Metropolitan Delta in the Context of Climate Change. A+BE | Architecture and the Built Environment, [S.l. ], n. 25, p. 1-234, oct. 2018. ISSN 2214-7233. Available at: <https://journals.open.tudelft.nl/index.php/abe/article/view/2660>. Date accessed: 20 apr. 2019. doi: https://doi.org/10.7480/abe.2018.25.2660.